Cottontails usually mate in January or February, and by the first of March, most of the does have mated. About 28 days after mating, the young are born, given a quick bath by the female and placed in the nest. Young rabbits grow extremely fast. By the end of the first week, they have their eyes open, and by the end of the second week, they are beginning to leave the nest and feed on green plants. At this time they still weigh only about four ounces, but are well developed and able to survive on their own. Litters may range from three to nine, with four or five about average. By six months, the young have reached minimum adult weight and are hard to distinguish from adults. 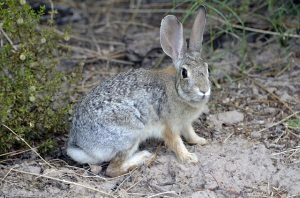 The cottontail’s weight at maturity is 2 1/2 to three pounds. Almost anyone who has found a newly planted seedling cut off or tree bark damaged may consider the cottontail a pest. If you want to shoot rabbits, you will need a permit from the DNR. (firearms can only be used where legal and during hunting season.